Reviews – Jan L. Coates – "What if…?" *…Whether they live in Halifax or elsewhere, when the time-travelling tune is finished and the child’s asleep in their bed, children will be full of questions about what their home was like ‘back in the old days’. Young and not-so-young alike, readers will enjoy this trip back in time. …Narrated by a child who is not referred to by a name or pronoun and not clearly gendered in the illustrations, the common restriction of adventures being for boys only is avoided. All readers will be better able to imagine themselves in the slippers of the time-traveler. With numerous opportunities to join in, including quacking with the ducks and melodic clickity-clacking of the trolley down Barrington Street and trot-trot-clippity-clopping with the ponies on Sable Island, readers and listeners become part of the time-travelling tune. *It’s hard to pinpoint the charm of this book. Partly it is Katie, herself, her precision and her colour sense, her need for her personal space; partly it is Catherine Marguerite’s letters, or bits of them, that we get in fits and starts, finding out about how life was back when, and partly it is the mystery of Katie’s background that the reader will probably figure out before Katie, herself, does. All in all, Talking to the Moon is a book with a mystery, an interesting protagonist, and good background material. It also has a moral: don’t despair over information that you have only heard as an eavesdropper; you may have it, or its context, completely wrong! *Skypig is delightful, not only for the story and its life lesson, but also for the colourful, mixed media illustrations which help provide the depth and breadth of the book… Pre-readers will be able to tell a story from the beauty and texture of the illustrations of the pig who tries to fly and his help who cheers him on. This picture book is highly recommended for whole class reading, individual reading, as well as for students learning about and experimenting with art forms and art media. *Award-winning Canadian author Coates spins a porcine tale of dreams, perseverance, and friendship. Del Rizzo’s colorful illustrations, made with Plasticine, polymer clay, and “other doodads,” are a good match… Ollie and light-skinned Jack are expressive, though, and they have a fey appeal. Piggie pipe dreams come to life in this agreeable book. *Jacob discovers the wealth of colours and textures surrounding him in the foliage, rocks, and wildlife in the park, fondly known as Keji. Gramps provides the opportunity for Jacob to look carefully and listen quietly, and the boy comes up with his own ideas, creating a sceptre from a stick, a crown of red berries and grass, and a throne out of a boulder. Sunset on the final evening in Keji fills the sky with gold and ruby, and Jacob feels he truly has become a king on this wonderful trip. 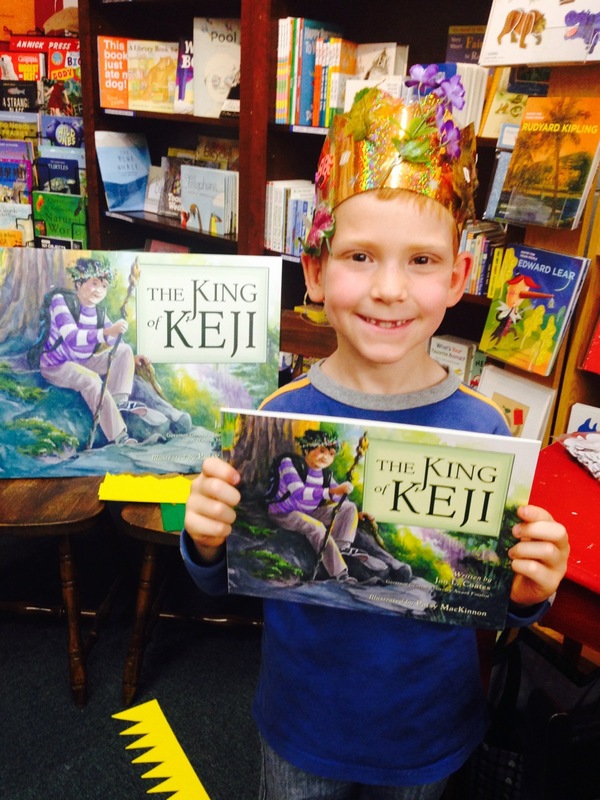 Moments of discovery are “photographed” by Jacob and Gramps….the overall idea of the book – learning how to be a king by appreciating the riches in the world around us – is well developed and handled with an appealingly light touch. *Jan Coates has given us a book of treasures found in the wilds of “Keji.” Patsy MacKinnon’s watercolor illustrations with Grandpa’s snapshot pictures within the book’s pictures are a wonderful addition in her brilliant use of colors to illustrate the text. Jan and Patsy have given children a chance to experience the wonder of nature through a lovely story of inter-generational sharing that will be a lovely addition to any child’s library. * What’s in a name? Pretty well everything, especially when your name is Bob but your cute little sister calls you Bobby, your perfect older brother calls you Stick-boy, the school bully calls you Blob, and the name you call yourself is Mr. Invisible. Bob Prescott wants nothing more than making the Division 1 school basketball team, but he’s not tall enough and not quite good enough. He and his family are struggling under the crushing weight of his father’s brain cancer and the painful cycle of up one day and down the next. Bob channels his desperation and sadness into his basketball training and finds a way to bring hope to his family and others living with cancer. 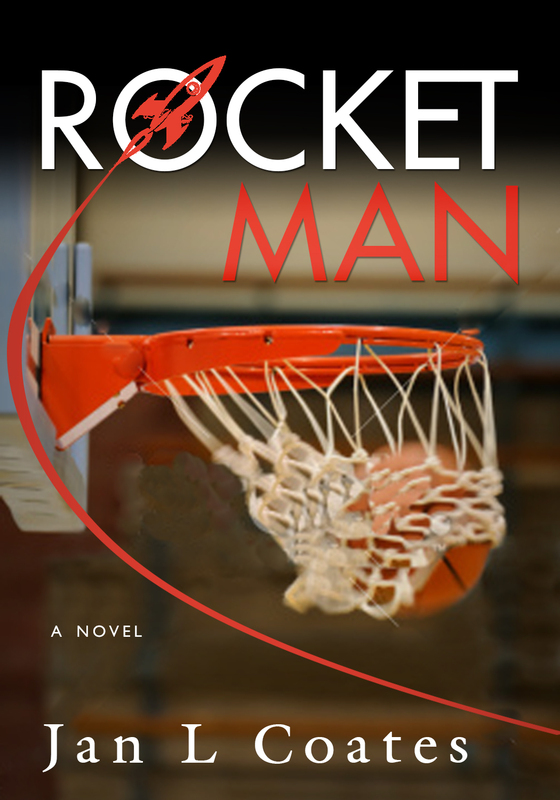 His determination and courage on the basketball court and in the rest of his life help him grow into his new nickname: Rocket Man. *Bob’s determination and drive to succeed as a basketball player help to create and sustain his self-confidence as he ultimately becomes not only a “hoop hero” as “Rocket Man,” but a community hero as the leader of a successful charity drive. Bob’s transformation into someone he is proud to be is shown by his eventual willingness to leave “Mr Invisible” in the dust in exchange for his full-throttle and highly visible identity as “Rocket Man”. Bob’s evolution creates a satisfying conclusion to Coates’ book. *… using the sport of basketball as a setting for a strong, emotional narrative is a great way to draw in a reading audience of young men. There’s some very cool storytelling going on here, guys! *i love this book! although at times its sad its always got me on the edge of my seat making me want to finish the book in one sitting. The power of harmony makes you smile tear up and want to go find the people in the book in real life and either hug them beat the up or help them. this booked is filled with emotions as sadness but at the same time happiness. I wasn’t sure that Jan Coates would be a good author but after reading this book i Know for a fact she is. *Simply stated, “The Power Of Harmony” is deftly written and thoroughly entertaining from first page to last. It’s sometimes said that those who teach can’t do. But clearly that is not the case with Jan L. Coates who is highly sought after with respect to her school of writing workshops given through the Writer’s Federation of Nova Scotia. An enduringly popular addition to community library Children’s Fiction collections, “The Power Of Harmony” is especially recommended for young readers ages 9 and older. *The harmony of Melody and Jenny is a powerful force, helping the two girls face extraordinary life challenges of death, shame, prejudice, grief, fear, and abuse. Together they support each other as no one else could, providing the strength needed to overcome those challenges. For two young girls, they endure much trauma, both within their families and more publicly. But Jan L. Coatesdoes not depict Melody and Jenny as anything but ordinary children, albeit more aware of how people treat each other. They are emotive (“Try to swallow the fat lump of sad in my throat.” pg. 143) without being emotional; kind without gushiness; and clever without being smart-alecky. It’s Jan L. Coates evocative text and careful plotting that elevate the girls to extraordinary while the history of Springhill, Nova Scotia, including the coal mining, the residential school and the prison, ground the story in reality. 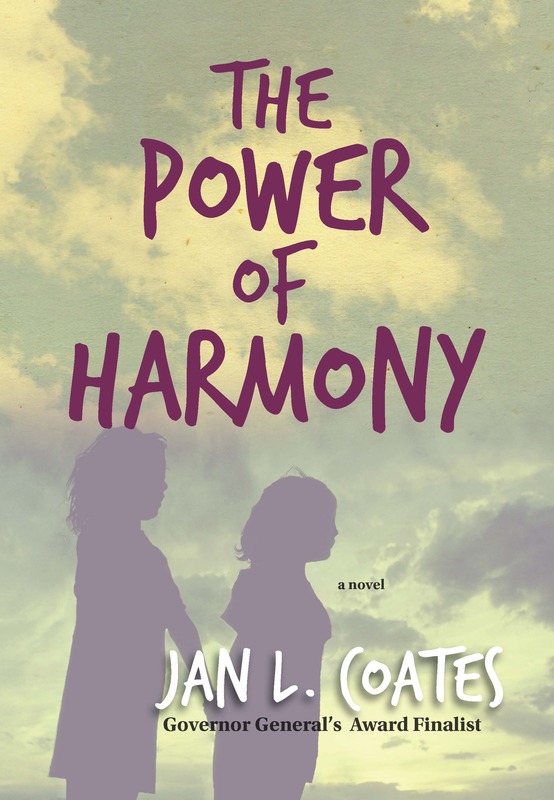 The Power of Harmony could have been a cacophony of anger, abuse and prejudice but, with Jan L. Coates’ considerate story-telling, it is a sensitive coming of age story in a socially-evolving Canadian setting. *Jan Coates has penned a superb novel for young adults that would keep them engrossed to the end. Lines such as: “Native people being good-for-nothing, is like saying all people with blonde hair are stupid,” will do much to inform young readers. *This novel, based on the life of the real Jacob Deng, provides insight into the struggles of the Sudan as well as a strong, clear voice. Coates gives an unflinching and poetic glimpse into the life of a boy who chose hope in the face of adversity. *By telling the story through the eyes of a young, Dinka boy, Coates simplifies the complex and difficult political and social issues, and makes the story of the Lost Boys accessible to young readers. Her reliance on the storytelling narrative style leads to simple but memorable images. In her interview, she states: “it’s my hope that children struggling with troubles of their own will read about young Jacob, admire his determination as he worked to overcome the tremendous adversity in his life, and be inspired, and perhaps empowered, to confront and overcome their own problems.” (p. 281) She and Jacob share a wonderful dream. *An important and well-written story. Jan Coates takes the reader deep into the lives of children dealing with the uproar of war and terror – a strong reminder that the world needs to do better. *Author Jan L. Coates tells the true story of Deng, a former refugee who went on to establish the Wadeng foundation for displaced citizens of Sudan, in a realistic and emotional way that will appeal to young adult readers with its sympathetic young hero and his quest for a better life. 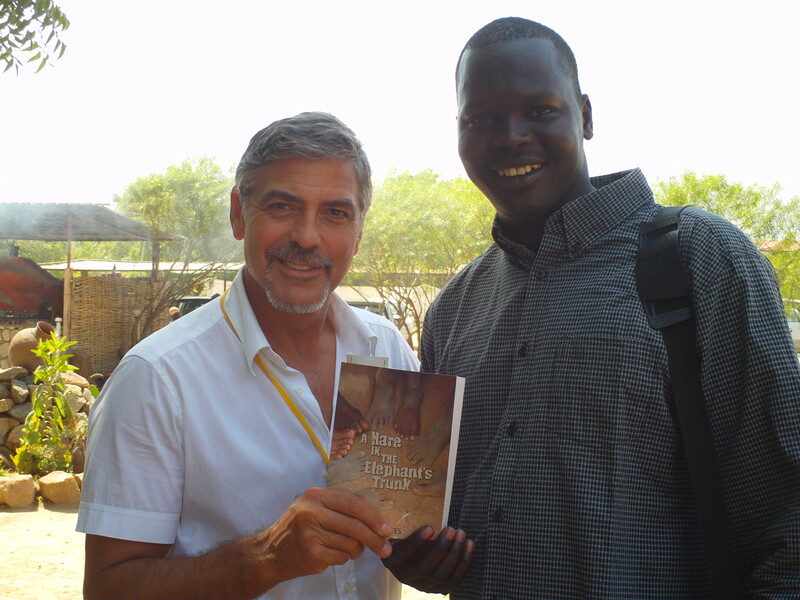 Jacob’s story, as well as the plight of Sudanese refugees in general, needs to be told to inform Western audiences of the relatively recent turmoil in the nation. Coates’ book, a stirring piece of historical fiction, does this well. *Coates’s detailed narrative is ripe with a multitude of themes and lessons for us: Jacob’s strength of character despite being in the midst of unimaginable suffering; the faith of these boys in believing that tomorrow was an opportunity for a better day; and how the road to peace is paved with education, not violence. One of the most compelling aspects of this story was Jacob’s learning to read. Jacob was a natural storyteller, inspired by the stories of his grandmother. Her stories and his memories of those stories were instrumental in helping sustain Jacob and his companions at the refugee camp. The power of storytelling and of reading is a message I resonate strongly with and is one of the biggest takeaways from this amazing read. *Jacob’s strength of character is almost unfathomable. His struggles and hardships seem insurmountable, but against all odds he survives – one of only a few. His unwavering ambition to get to school and his memory of his mother is what keeps him going. This isn’t a book about war. It’s a book about what happens to innocents affected by war. Ms. Coates has told a story that more people should be aware of and has written it in a way that manages to keep hope alive, through unbelievable adversity. Think about our lives from the age of 7 onwards, then read this book. *Jan L. Coates hits the nail on the head with the theme of education promoting peace and ridding of ignorance. The evils of war are a plague upon the earth, making so many suffer of all ages. A Hare in the Elephant’s Trunk is a riveting, compelling, and fast-paced novel that allows the characters to naturally shine, many who are complex and round. Jacob’s love of storytelling comes in handy many times, and even though he learns to read and write in English, he never gives up his family and his culture. *It’s always a risk for authors, setting a novel in a place and a culture that’s outside their own experience. But Jan Coates has succeeded wonderfully with A Hare in the Elephant’s Trunk. She gives the reader an uncomfortably vivid sense of what it must be like to lose one’s home and family, to wander aimlessly through a bleak and blasted landscape, in constant danger of starving or being shot. Such desperate circumstances could have led her young protagonist, Jacob, to become bitter, to resort to violence himself. And, working with such material, Coates could have written a very dark and despairing sort of book. But both the author and her characters rise above the situation and find in it an unexpected wealth of humour and humanity and hope. Portuguese, Spanish, Catalan, Braille editions available. *Rainbows in the Dark is a delightful story because it relays the message that judging by first glance you cannot always tell someone’s background. A little girl shopping in a store with her mother sees a woman looking for clothes. She also sees that she has a dog and decides to talk to her. The story promotes a sense of awareness about your surroundings and understanding how people react. In the end, the girl and lady that is blind strike up a friendship. The story does a great job at depicting what it’s like to meet someone with a disability and how they should not be treated differently. They are human beings too. The illustrations are colorful and grasp the concepts of each page. *A visual delight… Respectfully presents disability as part of diversity. Joanna’s vocation and presence the second-hand shop defy stereotypes. Their conversation about Joanna’s guide dog is handled particularly well. There are few characters with blindness in children’s literature, and the talented, generous, child-friendly Joanna is a welcome addition. *A delightful choice for young readers… Coates’ tale is neither too sweet nor too preachy. It is just the sort of book to help youngsters learn what it means to have a physical challenge. The dialogue is sure, the artwork expressive and sensitive and the story is a lovely one. New friends, a surprise concert, and the assurance that blindness does not have to deter a person from great accomplishment and satisfaction with life as she leads it. *Jan Coates gives her young readers a taste of what it is like to be blind; however, she does so in a lovely and up-beat manner. Illustrator Alice Priestley captures each moment of the story with colourful, cheerful illustrations. 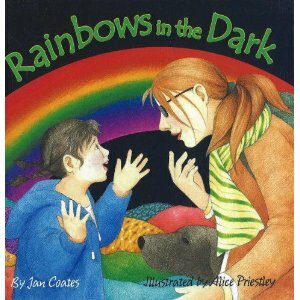 Rainbows in the Dark is a heart-warming read aloud and would make a nice addition to public library and elementary school library collections. Recommended. *The book will help to educate young children about the basics of guide dogs and blindness. Author Jan Coates brings a positive and heartwarming message to children. *A heart-warming tale… Alice Priestley’s pencil illustrations capture the Technicolour magic of this picture book. I love your books, currently I am at a new school since last year, Tamarec Education Center, Port Hawkesbury NS. Just wondering where the best place would be to buy your books? Also do you still do visit to schools. We are a P to 8 school with approximately 600 students with English and French Immersion classes. Hi Jan, i am so amazed with all the success you,ve had with writing childrens books. I am looking into starting a book, but have no idea where to start. Could you dirrect me to all the “where do i start and to whom do i talk too. There is so much info out there and im trying to talk it all in. So i guess im asking which steps did you take first?. Hi, Maxine – thanks for stopping by. I first started thinking about writing for kids about 15 years ago. I started with picture books, which I now know are the most difficult type to get published. There’s a ton of information on the internet about where to start, but mostly you just have to write every day, and possibly even more importantly, read good kids’ books every day. I spent hundreds of hours in libraries, and I still read several books every week, studying how other writers do it. The SCWBI has a forum called “The Blue Boards,” and it’s a wealth of information on writing for young readers. I’m also a member of CANSCAIP, an organization that has lots of good info in its publications and on its site. Perseverence and hard work are definitely essential – good luck!